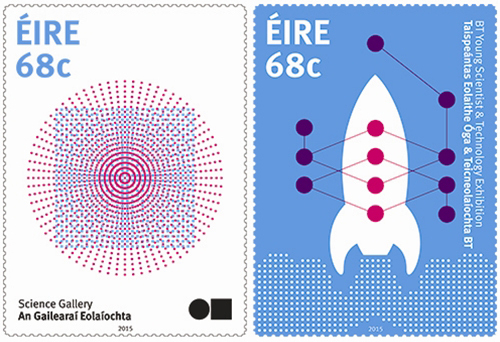 Science Gallery Dublin has been honoured with its own An Post stamp, as it reaches record footfall figures. The Science Gallery Dublin, which operates from Trinity College Dublin, has been honoured with its own limited edition An Post stamp, after only its seventh year in operation. This comes following An Post releasing two 68c stamps which celebrate Irish achievements in science in recent times. The other stamp features the annual BT Young Scientist exhibition. The release of the stamps comes following the announcement that the Science Gallery welcomed over 400,000 people through its doors in 2014, a 20% increase since 2013, and has had over over 1.8 million visitors since it opened in 2008. The Science Gallery has expanded its retinue dramatically since it began, with events such as TEDxDublin and Dublin Maker. The exhibit ILLUSION took to the road last year, reaching over 170,000 in San Diego, whilst BIORHYTHM opened just before Christmas in Taiwan. The current exhibition, BLOOD, will run until January 13th. The stamps are on sale online, in stamp shops around the country, and from the Irish Stamp Shop in the GPO.